Roofers and builders in Georgia have an abundance of experience with roof damage. Missing shingles due to high winds, structural damage after storms, and broken or damaged flashing are all common sights throughout the state. Homeowners often need repairs or even a total roof replacement immediately, depending on the severity of the damage. However, most homeowners don’t want to pay for new roofs over and over again because the roofing material can’t handle Georgia weather. Roofers and home builders need a product that will last, holding up easily to high winds and storms. They also need to know that they can procure these materials quickly in the event of an emergency roof repair. That’s why we carry CertainTeed roofing shingles at Brand Vaughan Lumber. Roofers are able to get the high-quality roofing shingles they need to complete their jobs, along with high-end service and quick turn around times that are necessary to keep things moving in a busy industry. A large percentage of the damage done to roofs in Georgia is due to high winds and impact from hail and debris. Georgia is also home to short winters and long hot summers, which means that regular, lightweight shingles aren’t a viable choice. They’re too likely to come off again in the next storm, leaving frustrated homeowners who want new repairs made on your dime. CertainTeed has a range of shingles that are designed to stand up to storm damage. These include their Landmark Roofing Shingles, which are a dimensional, heavy asphalt shingle with the appearance of a true wood shake. These beautiful, durable shingles have a 10-year algae resistance warranty, perfect for humid regions, as well as a 15 year, 110 mph wind warranty that can be upgraded to a 130 mph warranty when paired with specific starter, hip and ridge materials. In addition to their Landmark line, CertainTeed also carries a SBS-modified asphalt shingle in their NorthGate line. This tough, rubberized shingle resists cracking, reducing the number of broken shingles due to impacts during storms. NorthGate shingles are also algae resistant and can attain a wind warranty of 130 mph when paired with certain CertainTeed starter, hip and ridge materials. Choosing any of these tough, durable shingles will result in more satisfied clients and fewer repair jobs to return to after the next big storm. Once you pick the right shingle, you need a dealer who can provide the product, along with great customer service and reliable inventory levels. Brand Vaughan Lumber has partnered with CertainTeed to help ensure builder and roofer access to the best materials available. 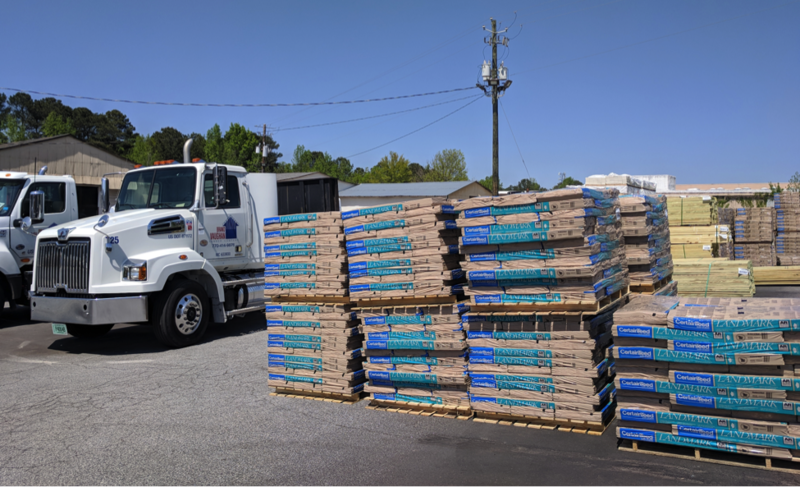 We keep a wide collection of quality shingle materials from CertainTeed in our inventory, so you can get the shingles you need in the timeframe you need them in. Since 1946, Brand Vaughan has strived to meet builder needs by providing “Extra Mile Service.” We’ll help you meet your goals and your client’s expectations. With our extensive inventory and ability to turn orders around quickly, you’ll have no trouble getting the materials you need to the job site when you need it. Whether you’re installing a new roof or making repairs, trust Brand Vaughan Lumber to get you the material you need. With the quality materials and upgraded warranties available from CertainTeed, you can be sure to meet all of your client’s expectations. Contact Brand Vaughan Lumber for your CertainTeed roofing materials and grow your business effectively throughout the state.